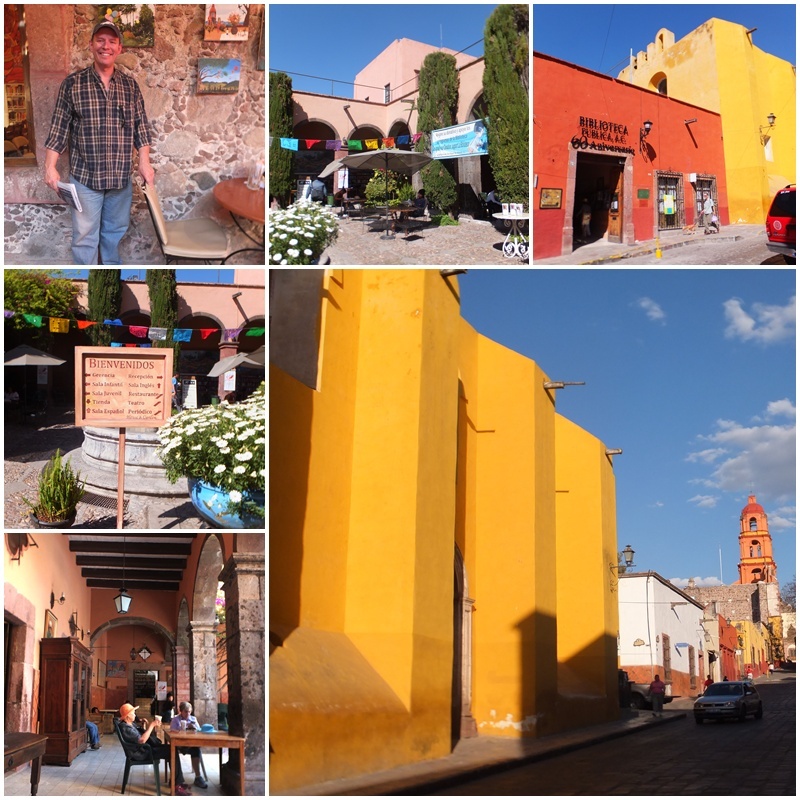 After my excursion to Rancho Los Labradores I went back into the historic centre of San Miguel de Allende to explore another well-known landmark. “La Biblioteca” (“the library”) is one of the most important non-profit community organizations in San Miguel de Allende. This organization was founded 60 years ago by Helen Wale, a Canadian, who started sharing her English-language magazines with the local Mexican school children. Today, La Biblioteca is the second largest English-Spanish bilingual library in all of Latin America outside of Mexico City, and it raises money to provide educational scholarships to countless Mexican children and teenagers from low-income families. At the library, I met Dale Eby, a Canadian expatriate, who relocated to San Miguel 7 years ago after hanging up his corporate career in Calgary. Dale retired at age 42 and dedicated himself completely to volunteering for the local community. He explained that La Biblioteca runs seven different social enterprises, including a book store, a café, a thrift store, local guided tours, home and garden tours and touristic excursions, all of which provide funds for scholarships for local Mexican children. Many hundreds of expatriates and locals volunteer for La Biblioteca which truly has truly become a cultural centre and cross-cultural meeting point in San Miguel de Allende. 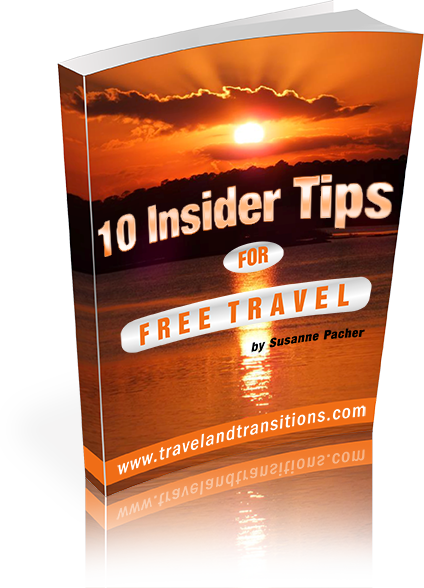 Dale explained to me that there are over 100 non-profit or charitable organizations in San Miguel. The spirit of volunteering and community service in this city is truly impressive. 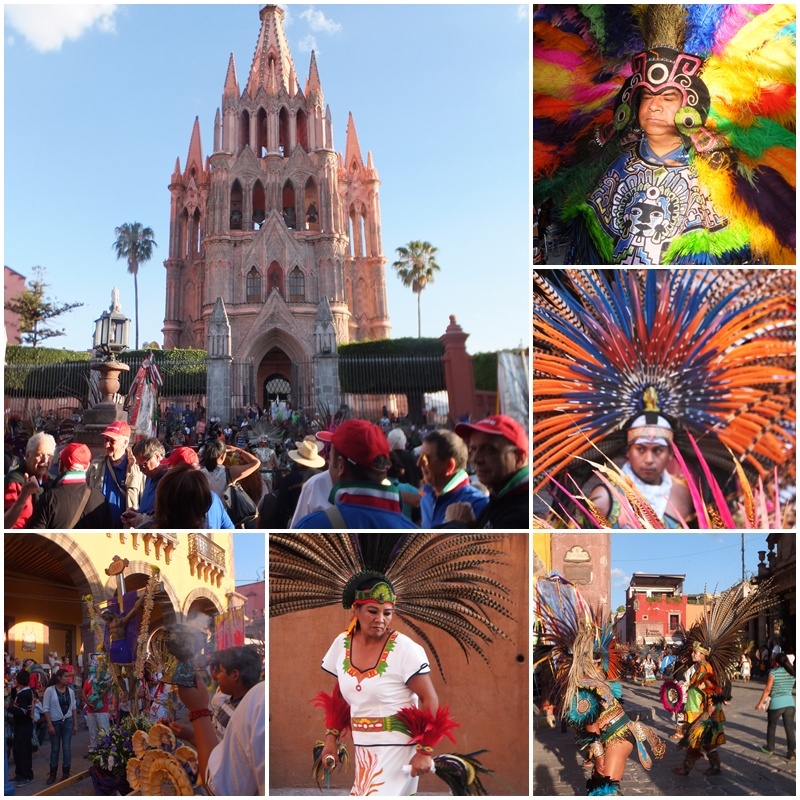 In the late afternoon I then walked back to the main square of San Miguel de Allende where the festivities of the “Fiesta del Señor de la Conquista” were still in full swing. The deep colours, the rhythmic drumming and the continuous dancing of hundreds of people in traditional dress left a deep impression on the onlookers. The intricately carved pink stone façade of the Parroquia de San Miguel Arcángel (the Parish Church of Archangel Michael) was starting to glow as the sun started to sink on the horizon. 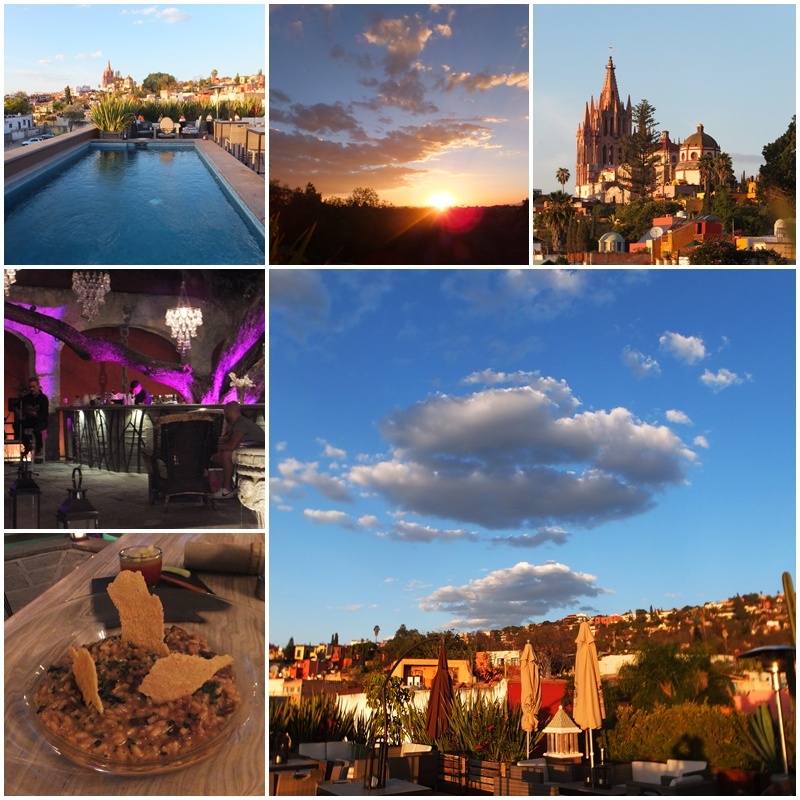 To witness one of the famous stunning sunsets of San Miguel de Allende, I headed over Hotel Nena, a boutique hotel that has a fabulous rooftop terrace with a swimming pool. As the sun started to near the horizon around 7 pm, the orange, yellow and reddish houses of San Miguel took on an even deeper shade and the pink hues of the magnificent parish church became even more intense. After the sun disappeared below the horizon I went downstairs into the romantically lit courtyard of this boutique hotel and had an enjoyable dinner featuring a scrumptious mushroom risotto at the Calenda Restaurant, accompanied by the live music of three musicians. It’s hard to explain but the incredible charm of San Miguel de Allende just reels you in, the more time you spend there.